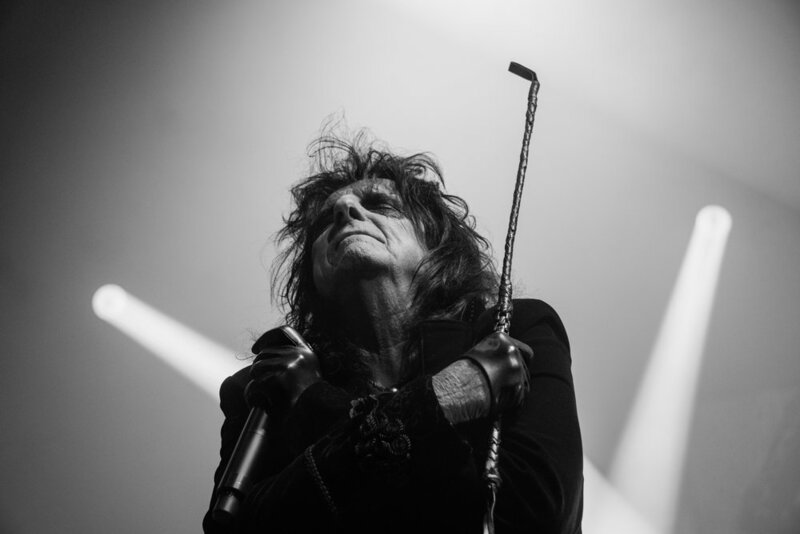 As rock icons go, Alice Cooper is one of the greats in a variety of ways -- as a performer, as a songwriter and as a guy. 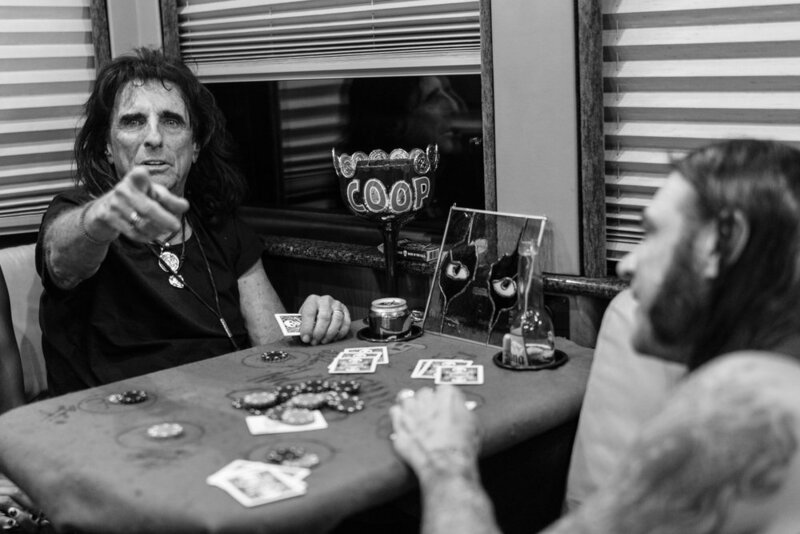 So to have the chance to be on the road with Cooper and be his official photographer for a decade brings about both many great stories and great images. Photographer Kyler Clark, who often works under the name CerealKyler, is the photographer who has been with Cooper for a decade. 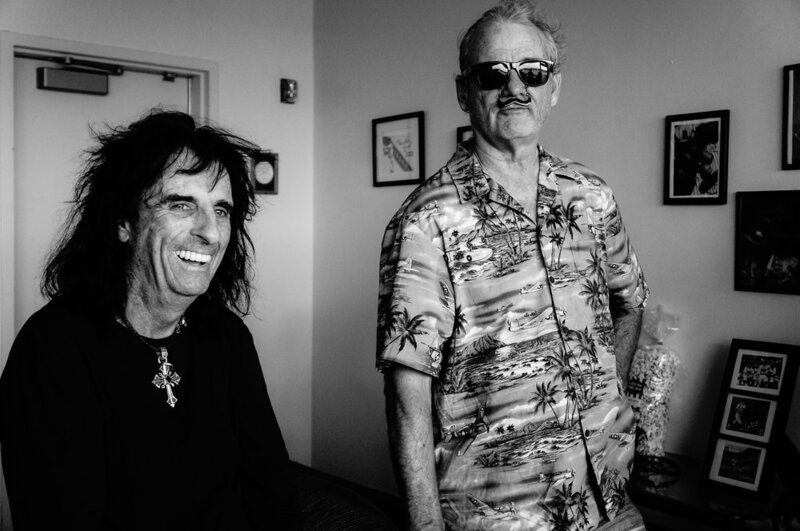 Through that he has shot or met with Foo Fighters, Jimmy Page, Cooper's Hollywood Vampires band mates such as Joe Perry and Johnny Depp, and countless more. But it all comes from his relationship with Cooper. Clark spoke with Greyland about working with Cooper, getting his favorite shots, how being a touring musician helped lead him back to photography and why he shoots like a "wildlife photographer." Greyland: I love Alice, he’s such a good dude. So you’ve been with him for 10 years you say? Were you shooting before that? Kyler Clark: I started out as his guitar tech in 2006, and then the last 10 years I’ve been his assistant. I got into photography in high school, went to college for music and was gonna be a performer. So I had an eye for photography, it was always something I wanted to do. It was never a priority and then we started touring and there were things to take pictures of and I got back into it. All of a sudden live was interesting, so even when I was a guitar technician I had a camera with me and I would try to get those behind the scenes things. Access with Alice had developed slowly, you have to be respectful when shooting but eventually they just let me do whatever the hell I want. Greyland: I did a book years ago with Linkin Park, it came about because they had a photographer on the road with them. Greg Waterman. He and I were talking about it. As a photographer is just back in the wings and you have no idea the photographer is there. Clark: Oh yeah, that’s the idea. I like shooting people like a wildlife photographer. I like to be off on the side, I have my camera always on me, you’re just discreet about it. Pop off a few things, then move and get out of the way. I’m doing other things while I’m shooting, my other gig is being his “guy.” Sitting in the dressing room, there are any number of things I’m also doing at the same time so I never really have that much time to sit there and linger. So a lot of the times I’m popping off shots drive by style, and that’s kind of worked to get a real casual, candid, library of images. I probably have two million images of him over the course of the last number of years, easily, if I look at my archive. I think having that casual access really makes a big difference. If I were to go to Alice and say we need photos for “this,” it’s a different attitude, he dresses differently, its a more structured thing and he’s not himself that way. He just kind of becomes on and I like it when he’s off. Greyland: You can go and work with someone, you can be best friends, you can have a great vibe, but it doesn’t necessarily mean you’re going to have great chemistry, you don’t know that until you start working together. When did you know that you and Alice had this chemistry? 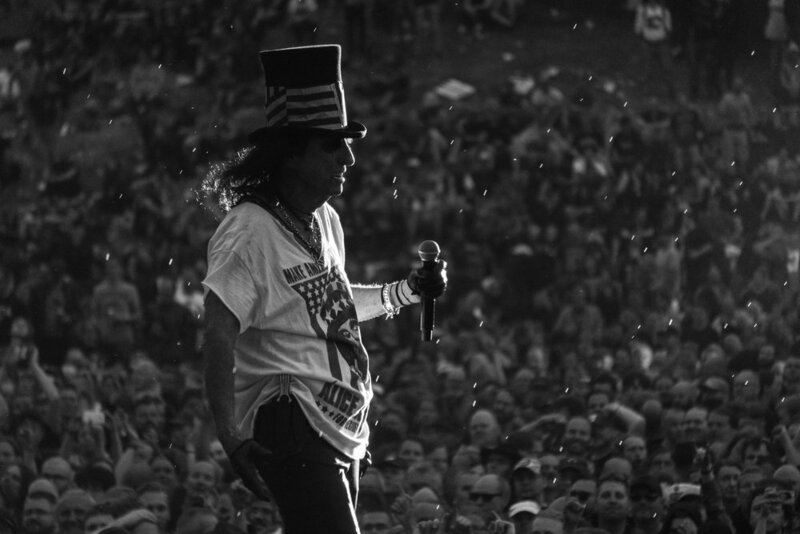 Clark: When I was on the road as a stage guy, everybody on the tour typically gets thrown in the show, you’ll have to be in some stupid outfit. That was pretty early on, first couple rehearsals they’d say “Kyler, you’re going to do this,” we kind of hammed it up and developed a chummy friendship that way and then whenever it became time for me to work closer with him it was natural. Pretty early on we had a funny working chemistry together on a personal, buddy level and then as far as photography goes I think we’ve just been there. When I first started with him, he was comfortable around me. I’ve known his daughter for a while and that comfort level was really important for he and I. He knew I wasn’t an invasive photographer. I also didn’t start as a photographer so I didn’t read that way for him. He’s disarmed around that, so I think that played into that chemistry. Greyland: It’s funny working with Alice, having this access, doing all this stuff with him, has heightened and enhanced your career but when did you know this was a viable career? Clark: Yes. I’ve always been interested it. I’ve resonated with it, Bob, Annie's structured shoots and Bob’s more candid work really got me interested in the lifestyle of musicians. You see concert video footage but then you also look at magazines and there are these great photos of musicians and the lifestyle was always really active and exciting looking. I think that type of imagery really drew me to music. 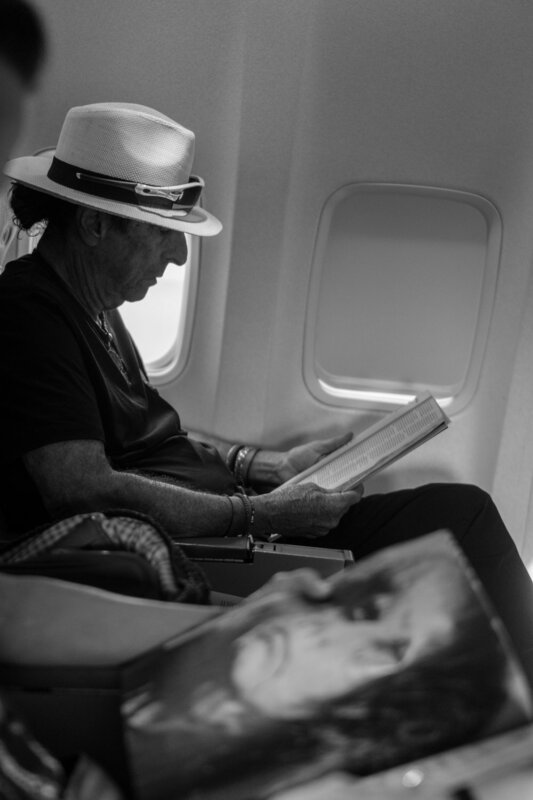 It wasn’t just music, it was the whole life, touring, it was the photography that really drew me in. I didn’t really do photography for bands when I was in high school, I was jus doing photography in general. When I moved to LA that’s when I started shooting bands. When I started touring that’s when I really had a lot of time to practice, I had nothing else to do besides practice this skill. That's all I do now, all day long, take pictures, it’s pretty great. Greyland: Obvious question, with Alice, he knows everyone, but for you is there one artist you’ve developed a rapport with? One artist you haven’t shot? Clark: Because of my access with Alice, a lot of time that access transfers. I’ve got my camera, I get candid shots of who he’s interacting with. We did a thing with the Foo Fighters last Halloween. Dave Grohl was filling in for Jimmy Kimmel, who had some family stuff so he had a bunch of guest hosts doing the show. Dave was hosting for halloween and he brought Alice in as the musical guest. Our band was just getting off of tour so the Foo Fighters backed Alice. During rehearsals I was just kind of chilling out shooting everything. I’m a huge Foo Fighters fan so being in that studio where they record and rehearse and prep for tour was really cool. Love the Foo Fighters and because of my access to Alice I’ve been able to shoot a couple of their shows casually. 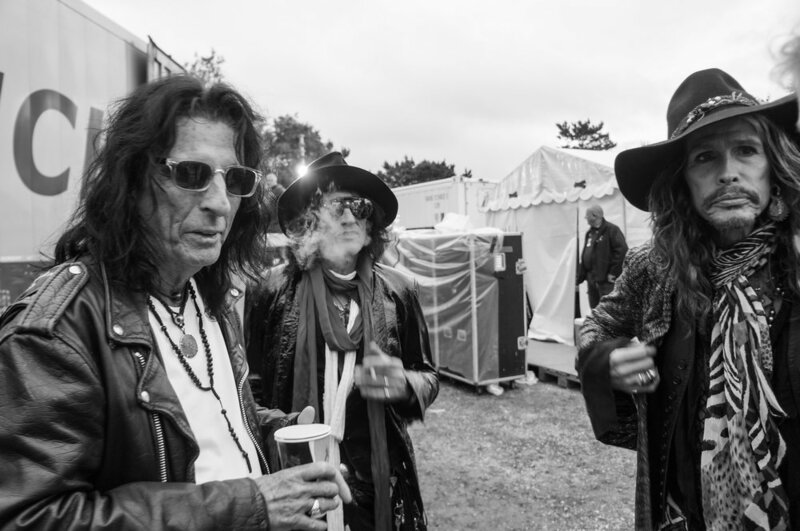 Alice has another band called the Hollywood Vampires, Alice, Johnny Depp and Joe Perry. They have a rotating cast of band members and they were recording their first album at Depp’s house, so everybody coming in and out, Joe Walsh, Paul McCartney, being in the room when those guys are recording. You’ve got them all in the studio. Basically the last 12 years I’ve probably been primarily Alice, but I get this peripheral access to people. It’s taken me back to bands I’d like to access, but anybody thats interesting. Iggy [Pop] would be a great one. I could go down the rabbit hole, but I’ll end up distracted. 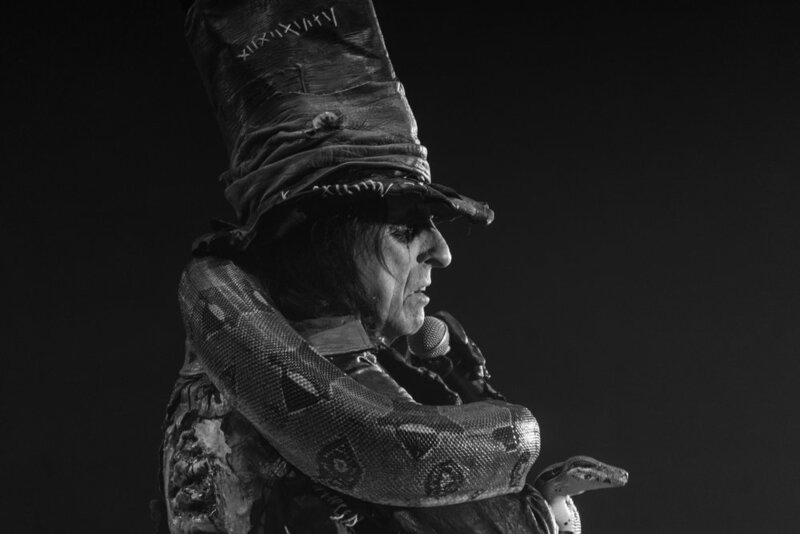 Clark: It’s wild, when I think back to my first time ever getting into Alice I was listening to "Bed Of Nails," it’s the first song of his I ever knew, one of my friends introduced me to his stuff. 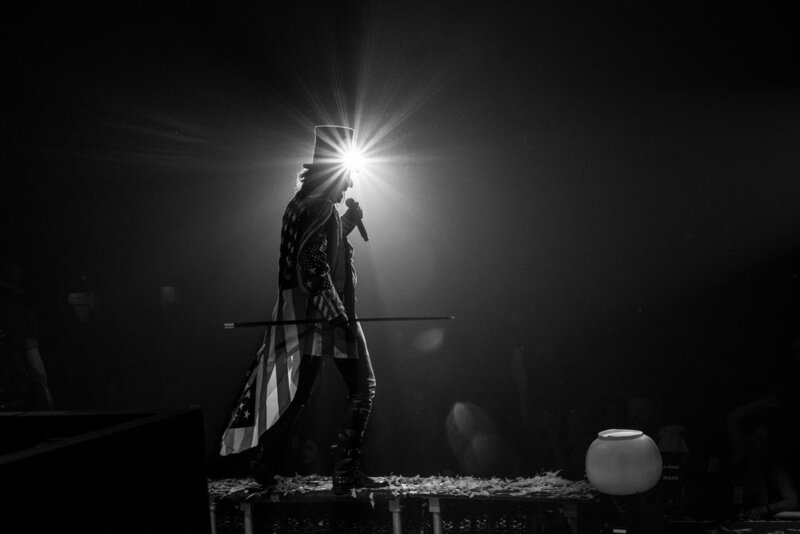 I think back to that weird scary kind of character, fast forward, I tour with him 300 days a year. There are a lot of pinch me moments. I don’t think anyones had this kind of access to him in his career. It’s really an honor to be around him in that aspect. Certainly everywhere we go guests will come around, we were in London and Jimmy Page and Jeff Beck were there. We were just kind of chilling backstage and they were just chatting, Jimmy Page, sometimes I have to stop because I get so wrapped up in the day to day stuff. 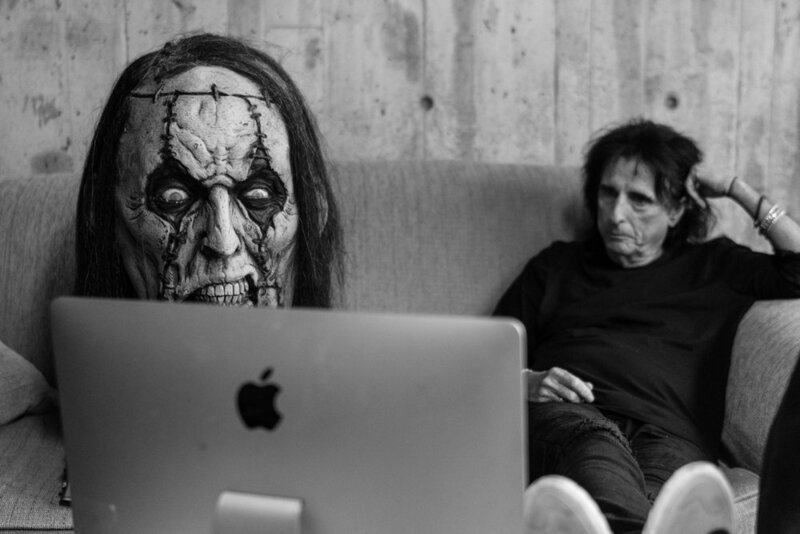 To be honest I’ve shot Alice so much that as a photographer I don’t know what else I can get, any kind of show changes, costume changes are exciting to me, something different visually, but I get wrapped up in that same old same old, so when people come around like that I’m like “holy crap.” But then I remember I work for Alice Cooper and I’m the only guy on the planet that gets to do this. Greyland: You say you’re not sure what you’ll still get with Alice as a photographer. Guests bring in new energy, new infusion, mix it up. He’s gone through so much, I think that’s what differentiates him, he’s appreciative of to be in this place. Talk about the positive energy. Clark: I could never work for somebody this long and dedicate all of my time if he wasn’t a wonderful human being. He and his wife have been married for 43 years, he’s been sober for 35 years and he’s inspiring. I’m around him 100 percent of my time, he’s inspiring. He’s been through the worst possible stuff and he still has creative energy to give to the world. It’s inspiring to be around somebody like that. I think his marriage with Cheryl is particularly inspiring. We’re family, if I’m going through stuff or having a mood on the road, we’re on the same bus, around each other all the time and theres moments when they give great advice as human beings, not a rock star. He’s a man of faith, family. He’s got kids, I’ve got kids. He’s raised kids from afar and gone through all of the hardships of being on the road. He’s definitley a great influence. Greyland: When you look back on it are there one or two shots of Alice that really for you look back on and you feel like you really captured Alice? Clark: I get to shoot the show all the time and there are moments of the show that are exciting and all that. 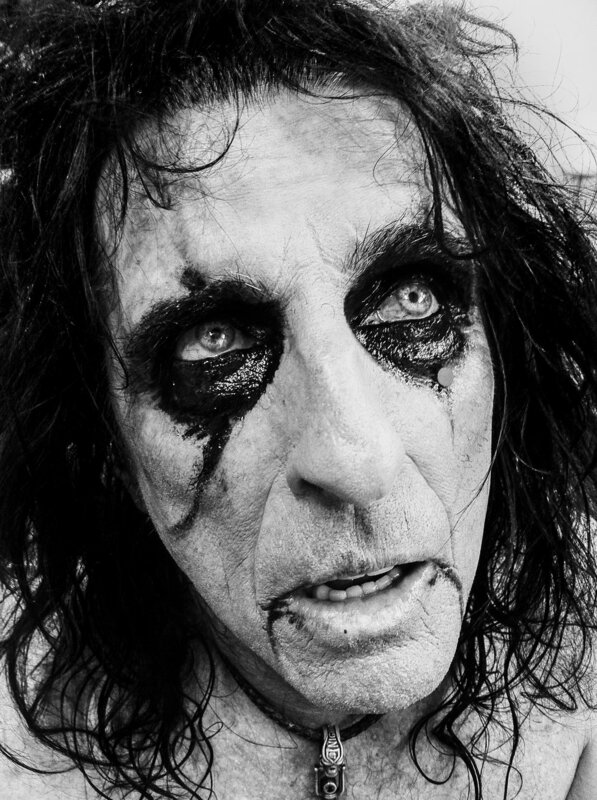 My favorite photos of Alice are photos of him in everyday life, before the show, after the show. Almost every show I take pictures of him putting on his makeup. I love the change, he changes visually and personality wise. There's a point where he changes, about a half an hour before the show he’s getting dressed and putting on his makeup and that dichotomy between him, the funny guy and this Alice character he’s created really becomes apparent. I love capturing those things. He’ll tell you the way he portrays Alice on stage isn’t human. As you can see him on the way back to the dressing room he’s Alice but you can see him as Alice the normal everyday human. It’s fascinating to watch that because he’s got these strict rules for this character. So any candid moment like that are my favorites, theres an unending supply of them. Out of concept Alice is really great too. Theres a photo of he and his wife at the mall in 2016. Alice is doing his run for president, he does it every election where he “runs for president.” He’s on the phone his wife on the phone, he’s doing an interview and she’s on the phone doing something else. It looks like they’re on the campaign trail. There’s a weird stack of onion rings, it just doesn’t make any sense. Out of context Alice is really exciting to me. Very visually interesting.